One of the craziest guys on Earth has officially gone faster on his skateboard than I could ever go in my first car. World champion downhill skater Mischo Erban set a Guinness record for fastest standing skateboard speed, clocking in at an utterly insane 80.74 mph. It’s impossible to know what flying down a mountainside in Quebec at that speed would feel like without actually doing it, but Erban and Recon Instruments bring us one step closer to the sensation with some cool POV footage. Erban clipped an Android-powered HUD prototype to the right side of his helmet, flipped it on and hit the road. 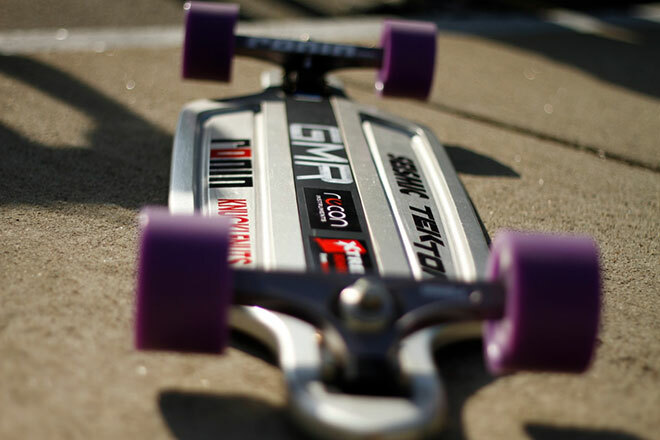 Erban rides a GMR deck with an aluminum spine that holds the trucks in perfect alignment so the board tracks straight and true in the neutral position. The board features Ronin trucks and 85 mm wheels with ceramic bearings. It’s a package built for speed. Erban, who lives in British Columbia, has been training for this since 2007, when Douglas de Silva of Brazil set the record at 70.21 mph. Erban hit 80.83 mph on a 12 percent incline in Colorado two years ago, setting a record for the International Gravity Sports Association. That run was at 6,000 feet; Monday’s run occurred essentially at sea level, where there is more air resistance. Hence, the Guinness record. Hitting that kind of speed is fun, Erban said, especially when the pavement is good. Until, of course, it’s time to stop. Skateboards don’t have brakes, and you can’t just step off. You wouldn’t jump out of a car going 80 mph, would you? So how do you stop? Wind resistance. “Pop out of the ball you were in, open your arms up and make yourself as big as possible,” Erban said. Then dare to put your foot down.